Over the past thirty years, the Star Trek franchise has been visited again and again, from Heritage Models’ Star Trek: Adventure Gaming in the Final Frontier in 1978 and FASA’s highly regarded Star Trek: The Role Playing Game, the original Star Trek RPG in 1982 to 1993’s Prime Directive from Amarillo Design Bureau, Inc. and published by Task Force Games and 1998’s well received Star Trek: The Next Generation Role-playing Game from Last Unicorn Games. The very latest entry in the Star Trek roleplaying canon is Star Trek Adventures: The Roleplaying Game. Published by Modiphius Entertainment in 2017, this focuses on the Star Trek: the Next Generation era and employs the 2d20 System previously used in the publisher’s Mutant Chronicles: Techno Fantasy Roleplaying Game and Robert E. Howard’s Conan: Adventures in an Age Undreamed Of. Although the roleplaying game has been supported with a number of supplements and miniatures and dice sets, until now, the entry point for Star Trek Adventures has always been the core rulebook, but that changes with the release of the Star Trek Adventures: The Roleplaying Game Starter Set. The Star Trek Adventures Starter Set is designed to get a game and running with relatively little fuss. Open up the box—and it is a proper box rather than a tuck box—and you will find a set of dice, a set of three types of tokens, several poster maps for use with the campaign, six character sheets, and two booklets. The dice consist of two twenty-sided dice and four six-sided Challenge dice, the latter being marked with a star on one face, two stars on another, blank on two faces, and the Starfleet insignia on two faces. These are primarily rolled for damage in both personal and starship combat. The tokens consist of Threat and Momentum tokens, the former used by the Game Master to grant NPCs advantages and the latter by the players to grant their characters advantages, plus tokens for each of the player characters, the NPCs, and the starships used in mini-campaign which comes in the box. The two mini-poster maps are double-sided and depict areas aboard starships and on planets and are designed to be used in conjunction with the tokens. The character sheets are double-sided, the character being on the front, the reference for what the character can do being on the back. The sixth character is actually the party’s starship, the USS Magellan, a Galaxy class explorer. The actual player characters consist of a male Bajoran First Officer, a female Human Conn Officer, a male Trill Chief Engineer, a female Andorian Chief of Security, and a female Vulcan Medical Officer. This is a good mix, but were a sixth character be needed, then there is room for a Science Officer. From the characters available, it should be obvious that the default setting for Star Trek Adventures: The Roleplaying Game Starter Set is late season Star Trek: The Next Generation. The first booklet in the Star Trek Adventures: The Roleplaying Game Starter Set is ‘Star Trek Adventures: The Roleplaying Game Starter Rules’. The slimmer of the two books in the box and intended to be read by both the players and the Game Master, this explains a little of the background, what a roleplaying game is, the basics of characters, how to roll tasks and handle conflicts, including starship combat. A character is defined by Attributes, Disciplines, and Focuses. The six Attributes are Control, Daring, Fitness, Insight, Presence, and Reason, and these range between seven and twelve. The six Disciplines correspond to the six areas of training at Starfleet Academy and these are Command, Conn, Security, Engineering, Science, and Medicine. They range between one and five. Focuses, such as Quantum Physics, Warp Field Dynamics, Helm Operations, and Xenobiology, represent areas of specialised knowledge or expertise. To undertake an action, a character’s player rolls two twenty-sided dice, aiming to have both roll under the total of an Attribute and a Discipline. Each roll under this total counts as a success, an average task requiring two successes. Rolls of one count as two successes and if a character has an appropriate Focus, rolls under the value of the Discipline also count as two successes. For example, Lieutenant M’kress, a Vulcan-Klingon hybrid Science Officer needs to take control of the Conn of a shuttlecraft in an emergency. The Game Master decides that this is a Daring+Conn check, so with a Daring of 9 and Conn of 2, M’kress’ player needs to roll 11 or less to get any successes. Later on, when Lieutenant M’kress needs to analyse some spectral phenomena, her player will roll 16 or under as her Reason is 11 and her Science is 5. She has the Astrophysics Focus, which means that rolls below her Science Discipline count as two successes. Whilst rolls of 20 add complications to a situation, excess successes add to the Momentum pool shared by the players. Momentum can be spent to create an Opportunity and so add more dice to a roll—typically needed because more than two successes are required to succeed, to create an advantage in a situation or remove a complication, create a problem for the opposition, and to obtain information. It is a finite ever-decreasing resource, so the players need to roll well and keep generating it, especially if they want to save for the big scene or climatic battle in an adventure. Conversely, the Game Master has Threat which can be spent on similar things for the NPCs as well as to trigger their special abilities. Combat uses the same mechanics, but offers more options in terms of what Momentum can be spent on. This includes doing extra damage, disarming an opponent, keeping the initiative—initiative works by alternating between between the player characters and the NPCs and keeping it allows two player characters to act before an NPC does, avoid an injury, and so on. Damage in combat is rolled on the Challenge dice, the number of star symbols and Starfleet insignia symbols rolled determining how much damage is inflicted. A similar roll is made to resist the damage, and any leftover is deducted from a character’s Stress. If a character’s Stress is reduced to zero or five or more damage is inflicted, then a character is injured. Any Starfleet insignia symbols rolled indicate an effect as well as the damage. In keeping with the tone of the various series, weapon damage can be deadly, melee or hand-to-hand, less so. Rules cover stun settings and of course, diving for cover. Starships are treated in a fashion similar to characters, but have Systems and Departments instead of Attributes and Disciplines. 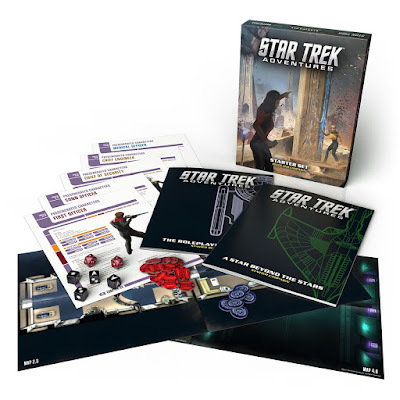 The ‘Star Trek Adventures: The Roleplaying Game Starter Rules’ covers common starship actions like piloting and scanning, whilst starship combat is similar to that of personal combat. Instead of injuries for taking five damage in one hit, a ship suffers breaches which can knockout a ship’s systems. Her crew or a player character can repair them, but too many breeches and ship is disabled or even destroyed. Overall, the ‘Star Trek Adventures: The Roleplaying Game Starter Rules’ gets through the rules at a fair pace, in just twenty or so pages, with an example or three. There is a handy reference guide to the mechanics on the back page and each of the character sheets has further reference tables on its reverse. The second booklet is ‘A Star Beyond the Stars’, which is a three-act scenario set in late season Star Trek: The Next Generation. It begins with the player characters’ ship, the USS Magellan being assigned to locate a missing Starfleet vessel. This is the USS Alcubiere, an Oberth-Class vessel testing a new Warp engine. The crew discovers the vessel adrift amidst subspace interference, so an away team has to go aboard and determine what has happened to both crew and ship. The plot of the adventure takes the crew of the Magellan along the frontier of Federation space and beyond, confronting foes that figured prominently in Star Trek: The Next Generation. As well as presenting both plot and NPCs, it takes its time to explain what rolls by the players need to be made and when, these increasing in complexity until the climax of the scenario which brings starship combat into play. Overall, the scenario is well written, but if there is an issue, it is that is perhaps a little too much of an emphasis on combat. Now this is due to it being written more as a roleplaying scenario rather than as an episode of Star Trek: The Next Generation, and this is not to detract from it as a scenario. Rather that a Star Trek devotee coming to the scenario may find the emphasis to not quite what they were expecting, especially given the lack of a Science Officer player character. Nevertheless, approach this as an action mystery taking into account the Prime Directive and Starfleet’s ‘shoot last, ask questions first’ attitude and ‘A Star Beyond the Stars’ should provide between three and four good sessions’ worth of play. There is even room for a expansion here and there for the experienced Game Master should she want to expand it. Physically, Star Trek Adventures: The Roleplaying Game Starter Set is an attractive looking package. Everything is done in full colour, whether it is the LCARS interface on deep black in the two booklets or white on the character sheets, the illustrations and the tokens, and of course, the mini-maps. The tokens are done on thick card and the dice are nice and sturdy. Of course, two twenty-sided dice are not quite enough, but more of these are easily obtained. All of which is packed into a sturdy box which has room for the Game Master’s notes. If there is a physical issue with the Star Trek Adventures: The Roleplaying Game Starter Set, it is that the two booklets are slightly flimsy and could have done with some proper covers. As a product, Star Trek Adventures: The Roleplaying Game Starter Set has problems at the beginning and at the end. At the end, there is a missed opportunity for the publishers to really point out to the Game Master and her players where to go next, what to look at next, and so on, essentially to help them both take their next steps into playing Star Trek Adventures: The Roleplaying Game. At the beginning though, the stepping on point for Star Trek Adventures: The Roleplaying Game Starter Set is not quite low enough. In other words, the Star Trek Adventures: The Roleplaying Game Starter Set is better suited to those who have had some roleplaying experience under their belt—especially the Game Master—rather than those who have had none. This is not to say that somebody new to the hobby could not pick this up and run it, but it would be a challenge. In the hands of an experienced Game Master, both the running of ‘A Star Beyond the Stars’ and the teaching of the rules to Star Trek Adventures: The Roleplaying Game as presented here should proceed at a handsome pace. For Game Master who is already running Star Trek Adventures: The Roleplaying Game, the Star Trek Adventures: The Roleplaying Game Starter Set is far from a pointless purchase. To support her existing game, it will provide her with dice, tokens, maps, and the character sheets. The ‘Star Trek Adventures: The Roleplaying Game Starter Rules’ can serve as a quick reference guide to the rules at the table, whilst ‘A Star Beyond the Stars’ provides a scenario which would work in most campaigns focussing upon Starfleet. The scenario is also adaptable to other time periods with some adjustments. The Star Trek Adventures: The Roleplaying Game Starter Set is an attractive, solidly designed boxed set with decent production values. Although not written as an introduction to roleplaying in general, the Star Trek Adventures: The Roleplaying Game Starter Set, with its exciting adventure and supporting material, is the perfect package with which to introduce a group and get them playing the Star Trek Adventures: The Roleplaying Game.